Kushal Magar taught me that competence in Hatha Yoga had long been a prerequisite for those who followed the Shaiva Tantra Tradition. However, whilst in his mountains this practice of self-knowledge through self-discipline begins with an exploration of the Yamas and Niyamas, all the yoga I had encountered in the West – with its preference for the external, visible and material – began immediately with, and was often considered little more than, physical positions. Yogic postures are specifically defined as asana, meaning ‘to come to rest’, or simply ‘seat’. The term’s Sanskrit root, aasa, means ‘posterior’ or ‘backside’; our common Indo-European origins have afforded English-speakers a familiar term of anatomical slang. Traditionally, these asana were only seated positions in which a practitioner could remain motionless without effort or discomfort in a meditative state, for as long as three hours at a time. Conversely, any position that caused pain or was practised with a restless body-mind was not recognised as a yogic posture. Although often overlooked in the modern, Westernised versions of yoga, it was always this profound mental focus that was the very foundation of all original asana. Kushal Magar spoke to me of 84 asana symbolising the 84 lakh (8,400,000) ‘states of being’ adopted by Shiva and Parvati in mountain myth that they might bring into existence every form of life in the cosmos. Arising from the shamanic roots of the Tradition, these original asana were therefore intended to embody the entire genetic map of organic life – from trees and herons to frogs and scorpions. Each authentic posture is therefore considered to exert a specific influence on human consciousness. This process is termed drdhata, a word that cannot be easily translated into English, but which incorporates the qualities of strength, stability, firmness and determination. And yet, Kushal Magar had also taught me that the number 84 was not literal, but metaphorical, a cultural symbol of ‘completion’. It is for this reason that the old texts commonly refer to ‘84’ principle tantra-agamas, ‘84’ tantric masters, ‘84’ primary phallic representations of Shiva, and so forth. In traditional mountain practice, only 33 of these 84 metaphorical asana are considered to be of any particular benefit. Even then, only four are deemed suitable for general use to master the breath, quieten the senses, promote a meditative state, and learn to discern what is best cultivated and what disregarded. These four postures are siddhasana (adept’s pose) or siddhayoniasana for women; padmasana (lotus pose); svastikasana (auspicious pose) or bhadrasana (gracious pose); and simhasana (lion pose). 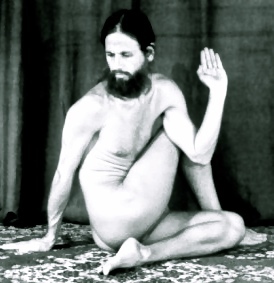 This last is sometimes replaced by ugrasana (fierce pose), now more commonly called paschimottanansana (seated-forward bend). Amongst the written commentaries of Hatha Yoga, only the 17th-century Hatharatnavali attempts to create a list of the metaphorical 84 asana. 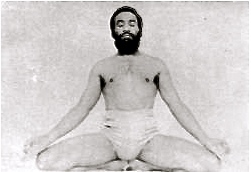 These include three varieties each of matsyendrasana (Matsyendra’s pose) and kurmasana (tortoise pose), four varieties of padmasana (lotus pose), five of kukkutasana (cockerel pose) and six of mayurasana (peacock pose). However, it only considers 36 of these asana to be effective and useful. Of other works, the Abubhav Prakash refers to 50 asana; the Gheranda Samhita and the Vishva Kosha 32; the Maisuru Maisiri 16; the Hatha Yoga Pradipika 15, of which it considers just four to be principle; and the Yoga Bhashya 11. Both the Thirumandiram and the Shiva Purana recommend just eight postures, the Sharada-Tilaka Tantram seven, the Shiva Samhita four, the Linga Purana three, and the Goraksa Samhita only two: siddhasana (adept’s pose) and padmasana (lotus pose). The Brhadyogiyajñavalkya and the Vasistha Samhita mention no postures at all. The reality is that no practitioner would ever need to perform 84 asana, even if these postures existed beyond their cultural metaphor. Of these, some are only fitting for the body if practised from the natural flexibility of childhood, whilst others are purely symbolic and of no profit. Certainly Himalayan practitioners of the Tradition employ very few postures in their sadhana, each asana being carefully selected and put into an order by their teacher according to their personal requirements. These few postures are sometimes practised four times a day, at the diurnal ‘twilights’ of dawn, midday, dusk and midnight. To each asana is normally applied pranayama (breathing practices), hasta mudras (hand positions), bandhas (physical locks) and/or mantras (repeated ‘seed’ sounds). When employed in purposeful combination under the guidance of an experienced and wise teacher, these activate the posture’s potential to promote positive change in the student or initiate – their single purpose, the restoration of the physical and mental balance that enables a steady expansion of awareness, and thereby consciousness. It was, therefore, with some surprise that I gradually came to realise just how many asana taught and practised today have very little to do with any ancient yogic tradition, a state of affairs I did not know whether to attributed to cynical deceit or simple ignorance. For this reason, the next advance in my research was to determine just how this peculiar, and largely unacknowledged, situation had come to be. You’ll find much more of Kushal Magar and his refreshingly practical mountain Tradition in Limitless Sky. This entry was posted in Uncategorized and tagged asana, authors, books, Himalayas, India, mantra, mountains, Nepal, niyamas, tantra, yoga. Bookmark the permalink.